I often wonder if previous experience in playing an #exergame impacts the overall experience and success of game play. Levac et al. also wanted to know whether motivation to succeed at the game impacted movement characteristics (quality and quantity) in children. Using force plate data while playing Wii Sports and Wii Fit #exergames, participants who had previous experience playing Wii Fit moved more than those without experience. As they also concluded, if exergames are to be used as a modality in rehab settings or as an educational tool, its important to sequence positive learning experiences to improve game performance as well as self-efficacy. There is increasing interest in the use of commercially-available virtual reality video gaming systems within pediatric rehabilitation, yet little is known about the movement characteristics of game play. This study describes quantity and quality of movement during Nintendo Wii and Wii Fit game play, explores differences in these movement characteristics between games and between novice and experienced players, and investigates whether motivation to succeed at the game impacts movement characteristics. 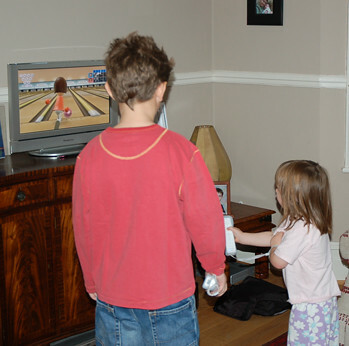 Thirty-eight children (aged 7-12) with and without previous game experience played Wii (boxing and tennis) and Wii Fit (ski slalom and soccer heading) games. Force plate data provided center of pressure displacement (quantity) and processed pelvis motion indicated smoothness of pelvic movement (quality). Children rated their motivation to succeed at each game. Movement quantity and quality differed between games (p<.001). Children with previous experience playing Wii Fit games demonstrated greater movement quantity during Wii Fit game play (p<.001); quality of movement did not differ between groups. Motivation to succeed did not influence the relationship between experience and outcomes. Findings enhance clinical understanding of this technology and inform the development of research questions to explore its potential to improve movement skills in children with motor impairments.